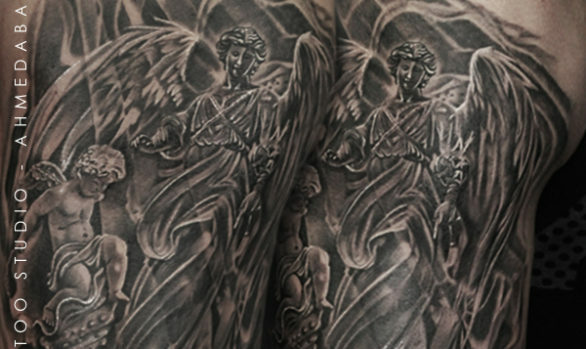 When it comes to tattoo design, map tattoo is chosen and appreciated by many people. For its unique appeal and charm as far as symbolism is concerned. A map is not only a mere outline of geographical location rather it signifies. The unity of people of the land. Imbibed with a patriotic theme, map tattoo is ideal for anybody. Men and women both can sport this tattoo. While men prefer to have such design on their back, chest, and abdomen. women like to sport such a tattoo on their wrists alongside the above mentioned places. Those who can not keep their feet in the same location for too long, certainly have a deeper connection with the world and their wandering spirit. Some of us just never can get enough in the way of knowledge. These folks see the world map tattoos as a reminder of all the locations in this world, that needs to be explored. When inked with the world map, each time a new language is learned. country is explored, or civilization is studied. The region can be inked in a unique color that is coded to a reference key beneath the map. Those who live on the high seas utilize maps each day. world map tattoos remind them of the journeys of the past and ones that are still on the horizon. The tattoo design can be split in half so one half appears on one foot, the other half on the other foot, symbolic of walking the earth one step at a time. Some split the tattoo design between two friends, lovers, or partners, a reference to being separated. now but some day together in the same location again. Many have to deal with being apart from the ones they love on a daily basis and have created a unique way to keep them close at hand.